Very sociable and wonderful to have Maurice Dean take part in his 3rd street O- pushed by Peter! Pictured are the top ladies with Maurice. More photos in the gallery. 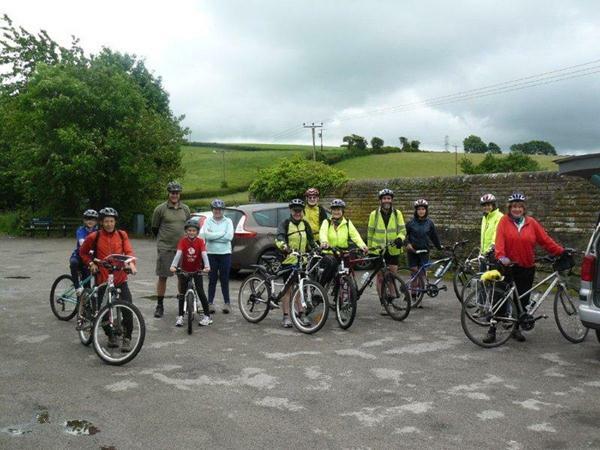 Sixteen SROC members took part in the annual cycle ride, starting in light mizzle and ending in glorious sunshine! The route stared just north of Lancaster and took in Glasson Dock, Galgate, the canal round Lancaster, Slyne and back to Denny Beck. 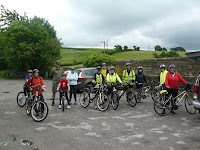 The café near Glasson was very welcome, and we are indebted to the Ockendens for a lovely lunch stop at their house! In all, around 30 miles was covered. 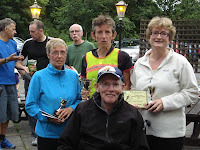 A list of all the prizewinners in the recently completed Preston Guild Street Orienteering Series may be viewed here. Series competitor Tony Marlow had this to say about the events: "They were all very well organised on good maps with good weather, new people and new members. They were in fact good social occasions too - maybe a model of things to come!!? The amount of work Bob has put in is phenomenal." Longsands was the last of the 'normal' Summer Street League series and pleasingly it was dry despite getting quite dark at times. Again there was an increasing turnout with two more new to the series and some others coming back. The mixture of urban and rural was well received despite the significant increase in the undergrowth in the last week and the presence of bovine spectators in some fields. The final event at Cottam is the mass start 1 hour score to be followed by the prizegiving - the final tables will go on the web at the weekend unless people want to be kept in the dark until Wednesday - let me know. See you at Cottam. Bob Nash. Results link and RouteGadget link. RouteGadget for the Prologue and Final for yesterday's event are now ready, and the updated league tables are on line here. Just two more events to go, so don't miss a chance to improve your position! Martyn Roome set two excellent courses, utilising all the best bits of the University of Cumbria campus, for this evening's round three of the sprint series. There were a few mispunches resulting from not reading the descriptions and codes closely enough! Results from the event are available from this page. Updated league tables and RouteGadget for the event will follow in the next day or two. Event 4 in the Preston street O series is on 20th June, details on the fixture list. Special details for the final event on 27th June have been published here. Tables for the series so far may be viewed via this link. The next event in the Sprint Series is at the University of Cumbria, Lancaster Campus, Lancaster, LA1 3DY. GR SD487609. Parking at the University Sports centre (as last year). Start times for the prologue 6.30-7. Final following the prologue. Overall results determined by the total time for the two races. You are warmly invited to the 2012 SROC cycle ride on Sunday 24th June. It will start at a convenient point close to Lancaster at 10.00am (unless the weather is not good enough – check back here the night before). The pace will be leisurely and distance 25-30 miles on road and cycle track, with the option of a short cut. It will be a different route to last year, but no less enjoyable! Of course there will be a morning stop at a cafe but bring lunch for after that. More details of the meeting point will be provided by Martyn Roome. Just contact him if coming, by email. Preston Guild street event runners may have noticed that event 2 did not immediately have a RouteGadget. This has been rectified now and it is accessible here. SELOC invite you to come and orienteer around the stunning cityscape of Salford Quays, amongst buildings such as the Lowry Centre, the Imperial War Museum and the BBC as part of a test event (level D) prior to a full level B event on a much wider area in 2013. See the flyer for full details. Despite the threat of rain we managed a dry event - a pleasing turn out with more new faces and interest from spectators. As you can read in my comments it was very nice that Maurice Dean was able to attend, and take part, courtesy of Peter Knott - many thanks for your efforts Peter. This was particularly pleasing as Maurice is the founding father of SROC Street Orienteering with the first event being held in 1967 at the very same venue we used last night. Don't forget that next weeks event is the last of the normal series with a definite rural emphasis (the final event is a mass start 1 hour event before the prize giving). Bob Nash. Results are on line here and RouteGadget is ready to receive your routes.